Nothing fancy but oh wow!!!! Newly Remodeled. Friendly Staff. Clean. Tasty omlette - crispy hashbrowns - very good!! Very clean dining room. Normal Huddle House menu, but the food was served piping hot and was very well prepared. Waitresses were friendly and efficient. Like I said in the title, a good place for a quick lunch. The wait staff was all incredibly friendly and the service was fast. Traditional diner type fare that was very tasty and an excellent value. Excellent breakfast. Waffles are fantastic. Large portions. Service was really good. Staff was warm and friendly. Recommend it to everyone! for me you can never go wrong with the huddle house. it is near the motel and the office where i work while on business. In fact the wairesses know my order and have my drink ready as I walk in the door. 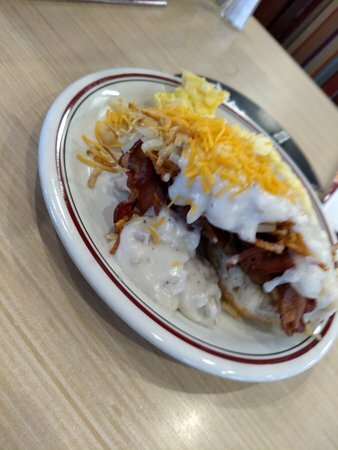 Get quick answers from Huddle House staff and past visitors.